Even before Aprilia’s first 1,000cc sportsbike, the RSV Mille, broke cover, there was talk of the Italian company building an RSV-powered sports tourer. Aprilia aimed to make the most of the Mille’s success by putting the stonking Vee twin motor – built to Aprilia’s specification by Rotax – into as many bikes as it could get away with. The most successful of these, the Tuono, was little more than a naked RSV with flat bars. But first, in 1999, came the SL1000 Falco – the SL stands for Sports Light – a budget RSV with a classy frame and a little less performance. 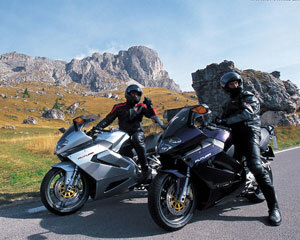 Then, in 2000, the company announced the big trailie ETV1000 Caponord – and the RST1000 Futura. Aimed squarely at Honda’s VFR, the RST (Sport Touring, of course!) bristled with innovation and technology as could be expected from a design team led by Bimota’s former chief engineer, Pierluigi Marconi – you can read more about the Futura’s development here. The new bike borrowed its name from Aprilia’s early 90s sports 125. The RST 1000 harked back to Aprilia’s ground-breaking AF1 FuturaAt the time the 125 Futura helped carve Aprilia’s image as a company that used brave technological solutions and bold styling to good effect. The company believed the 1,000cc Futura would further bolster that image, and show the world what a sports tourer should be. Both bikes sported a single-sided swing arm, although each has the arm on opposite sides, but the similarities end there. While the 125 Futura sold like hot cakes, the RST1000 Futura singularly failed to catch the imagination of the public. On paper it’s difficult to see why the RST1000 Futura failed to catch on.